I have had the NX100 for just about a year. I haven't really been using it very much because of the kit lens. The 20-50mm kit lens which does not have OIS built in is a pain to use indoors especially in low light without an external flash. 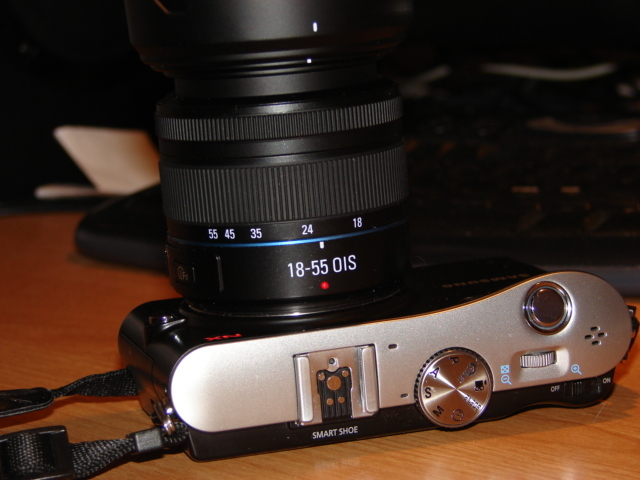 I really want to know from the NX100 users on this forum if you are happy with this lens or it is just me! I bought an 18-55mm F/3.5-5.6 OIS i-Function kit lens. A lightly used lens coming off from a NX200 for $149 shipped. The OIS is a blessing, I am so sick of blurry pictures from the 20-50mm. I look at the pictures posted on this forum taken with NX100 are outdoor shots which always turned out great. Does anyone use the 20-50mm indoors? Last edited by WCKSer; Aug 8, 2012 at 4:28 PM. I have the nx100 with the 20-50mm kit zoom. I hardly ever use it indoors. with poor high iso and no flash, it's mainly (to me) an outdoor carry-around. i use it for it's pros...size, easy to use bracketting, burst, ez access via buttons to settings. when i go indoors, i use my dslr. the nx line was tailor made for enthusiasts. now they need to catch up to sony nex. Thanks for the reply. I notice the same thing you mentioned. Without OIS on the 20-50mm, it is almost unusable indoors. I do have the little SEF15A flash but it is not that good. Curiously, this flash is a free gift when you buy the NX100 in Asia. The flash is sold separately in North America for just about $100. I bought mine from Ebay for $56. It works ok on automatic setting with the 18-55mm OIS. However, with the 20-50mm, the pictures often came out fuzzy because of the slow shutter speed the camera chooses. Most of the time I shoot with my Canon 430EXII on manual. That works a lot better than the SEF15A! I don't always want to carry around the 5DMKII for birthday parties, I thought the NX100 would be perfect for those kind of occasions. Now that I have the 18-55mm OIS, I will bring it as a backup camera traveling the the Silk Road in China in couple of months. This will also be perfect if I have to ask someone in the tour group to take my picture since most people can't handle DSLRs.